Tom and his brother Peter are very close and, when Peter is diagnosed with measles, Tom is upset that he is to be sent away to spend ten days with his aunt and uncle. But the pain of the separation from his brother is assuaged by an adventure shortly after his arrival. One evening, he discovers that the door to the back of the house leads to a secret garden which only appears at night. And in the garden he finds a young girl named Hattie, with whom he has many happy adventures. Night after night he returns, not noticing that she is continually growing older while he of course stays young. More frustrating, as Tom's brother recovers, it comes time for Tom to leave the house (and the opportunity to spend time in the garden with Hattie). It's a classic story (first published in 1958) but I've never read it before. One is immediately struck with how stiff and awkward the writing is (from a combination of the era when children's books were stiff and awkward with the English-ness of the writing and setting). The mannerisms (particularly Tom and Peter's affection for each other) also seemed a bit creepy at times. However, it has its charms. The tale is terribly innocent in a way that children's books don't allow much anymore. The appeal of the book (child able to take secret adventure to places adults can't go) is timeless, even if the story itself is horribly dated. 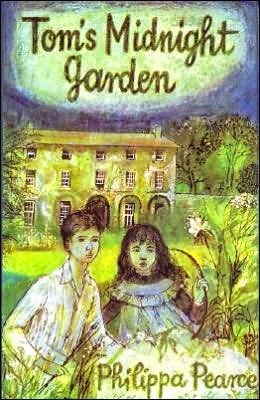 And the story, with a dash of The Secret Garden and Somewhere in Time even has a sweet romantic quality to it, although naturally enough (given the context it was written in) that romance is more infantile than passionate.